News.me for iPhone works well as just such an application. Its minimal interface allows you to sign in with your Twitter and Facebook accounts, importing all of your news items from both feeds into one aesthetic stream. Efficient and clean, News.me brings in only the links in your feeds. You don’t see statuses or comments. There are no advertisements, sidebars or posts about games. The new iPhone version of News.me thankfully syncs with the News.me iPad app and Instapaper and supports offline reading. What it did for my Twitter feed was remarkable. It turned Twitter into a news feed I wanted to engage with. I read articles from National Public Radio and the US Green Building Council far more than I do in the browser or the Twitter app. News.me was aesthetically clean and usable. The app’s Reading List is appealing though simple; anything you have as a “favorite” on Twitter imports as an article in your Reading List. There’s a bookmarklet available for the browser too. News.me makes the ability share an article painless. You can also spot what you haven’t read with ease; News.me grays out any article you’ve already seen. The News.me for iPhone app is appealing because it is clean and easy to use. 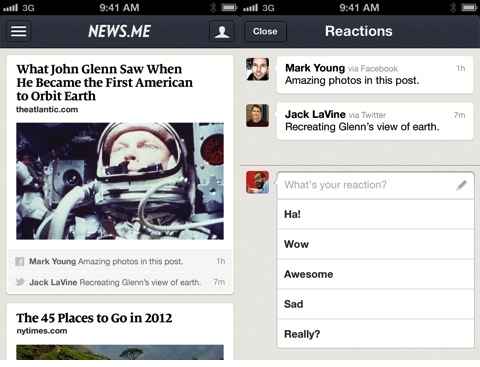 It transforms Twitter and Facebook into a readable, non-distracting news feed. There are really only a few flaws with the iPhone app, and they are tolerable. Though the “Reaction” section is fun, it’s fairly useless if you don’t have many friends using News.me. The other little annoyance is that fact that you cannot edit your comments. More visuals on incoming links would be a good addition; for many of the links in your feeds there are no images until you open the article. You have no ability to search for any article or topic either. Another downside is that you may invite Facebook friends to join you but cannot invite Twitter followers. There are a few little flaws with News.me, but ultimately it’s a very useful news reader. During this review, it motivated me to read articles I would have never read before by compacting all my news items into one clean feed. I enjoy it more than other news readers such as Flipboard because it is put together better. The small developer team from New York City did an excellent job. It’s cleaner and although you can’t import as many feeds, the simplicity helps you concentrate in a digital world that encourages distraction. I really enjoy News.me and will most likely continue to do so. AppSafari review of News.me for iPhone was written by Darius Reimm on March 4th, 2012 and categorized under App Store, Featured, News, Reading. Page viewed 4444 times, 2 so far today. Need help on using these apps? Please read the Help Page.